Originally trained for Film, Theatre and Special Effects in both Make-up and Hair, Liz worked within the film industry for a number of years before moving across to Fashion and Beauty. Vigo:A Passion For Life and Pandamonium both directed by the well renowned Director Julien Temple. Liz was also given the opportunity to work on the amazing “Modern Lovers” book by Bettina Rheims. After working on movies, Liz began to work on TV Commercials and Music promos which was then a natural progression into fashion and beauty. Liz headed the Make-up team for the first 3 shows for Alexander McQueen and later for Julien Macdonald and one of her first ad campaigns was for Prada. With an outstanding level of creativity, Liz is hugely motivated by working as a team to produce beautiful, creative, eye-catching images. 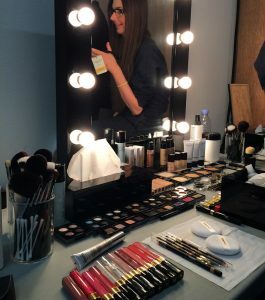 Never happier than on set, Liz works with a broad range of clients including Braun, Orlebar Brown, Forte Hotels, French Connection, Stella McCartney, Burberry, Mr Porter, Paul Smith, Facebook, American Express, Massimo Dutti, Esprit, The Ned Hotel, Thomas Pink, Harrods, Proctor & Gamble, Matches, Mr Porter, Zara and Bentley. Editorial titles include Porter, Kinfolk, Vanity Fair, Vogue Italy, Harpers Bazaar, Volt and Marie Claire. Personalities include Alex Lawther, Charlotte Le Bon, Emilia Clarke, Holliday Grainger, Maxine Peake, Sally Hawkins, Sophie Hunter, Tinie Tempah, Will.i.am, Yasmin Le Bon and Zawe Ashton.